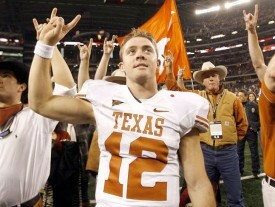 Should Texas retire Colt McCoy’s jersey? Should Texas retire Colt McCoy's #12 jersey? As we approach the Davey O’Brien award ceremony on February 15th in Fort Worth, let us think about the legacy that was handed down to Colt McCoy. Legacy is defined as what is handed down from the past. The legacy and legend that is Vince Young will forever be the heaviest burden that any first year quarterback could have ever faced. Maxwell, Davey O’Brien and National Championship are awards that will forever seal VY’s legacy for all Texas fans. What you do with that legacy in this case is what is truly remarkable. Colt McCoy added another record by becoming the winningest quarterback in history with 45 wins. Most Texas fans have been telling Austin American-Statesman writer Kirk Bohls what they think of him for some time now. Last night after his big awards haul, Texas quarterback [tag]Colt McCoy[/tag] also got in on the act. Later, after commenting that he didn’t play for awards and that they’re a credit to the team, McCoy still took a jab at Austin (Texas) American-Statesman columnist Kirk Bohls, who did not vote for McCoy for the Heisman. We’ll find out if Bohls’ unimportant vote (his thoughts not mine) cost McCoy the Heisman Trophy when the winner is announced Saturday night. 3: His three seasons with at least 3,000 yards passing is half of the Longhorn all-time total of six. No UT player has ever thrown for more than 3,000 yards in a season more than once in their career. 28: NCAA leading consecutive games with a TD pass streak. 36: Has accomplished his numbers in 2009 despite watching from the sidelines in many Longhorn blowouts. He has played in just 36 of a possible 44 quarters on the year. 45: Longhorn records held by McCoy. 20-3 (87%): McCoy’s career record in road and neutral-site games (includes loss at Kansas State when he was injured on first series of game). McCoy Heating Up: Over the past five games, Colt McCoy has completed 130-of-169 passes (76.9%) for 1,487 yards (297.4 ypg) and 12 TDs (2 INT). That works out to a 171.9 pass efficiency rating. Excluding sacks, he’s also rushed for 146 yards on 35 carries (4.2 ypc). He’s led the Longhorns to scores on 30 (23 TDs/7 FGs) of 47 drives (64%) in those games. Going Deep: Colt McCoy has completed 16 passes of at least 30 yards this season with 10 of them coming in the last five games. Of the 10 completions over 30 yards, six have gone for 40 or more, three for 50 or more, two for 60 or more and one for more than 80. Did You Know? : McCoy is averaging 27.7 yards per TD pass on his 23 scoring throws. Climbing the NCAA Charts: In addition to breaking the NCAA record for career QB victories (43), McCoy improved his career total offense numbers to 14,172, sixth on the NCAA all-time list. He also has 12,756 career passing yards (7th in NCAA history), 108 career passing TDs (7th), 126 career TDs responsible for (6th) and his 70.9 career completion percentage ranks as tops in NCAA history. On a Roll: McCoy has led the Longhorns to victory in 24 of the last 25 games (.960). That record includes two bowl-game victories and eight wins over ranked opponents. In those games, McCoy has gone 639-of-856 (74.6%) for 7,057 yards (282.3 ypg) and 58 TDs (18 INTs) for a 162.1 passer rating, while rushing for 838 yards and 13 TDs. He is averaging 315.8 yards of total offense and nearly three TDs per game. McCoy has thrown for at least 250 yards in 18 of the 25 games, at least two TDs in 19 and completed at least 70 percent of his passes in 19. He also has posted a rushing and passing TD in 10 of the games. I’ll Second That: McCoy joined Vince Young as just the second QB in Longhorn history to post back-to-back 11 win seasons. 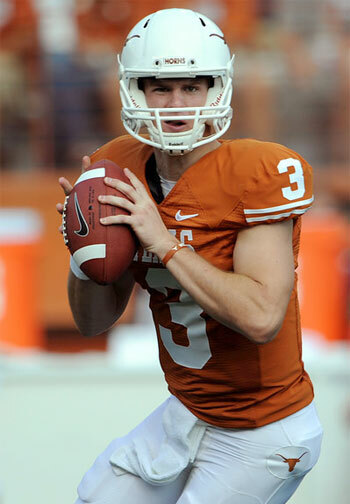 He is seeking to become the first Texas QB ever to register consecutive 12 victory seasons. The annual Herbie Awards list was released on ESPN this week and four Texas Longhorns garner honors from the ESPN college football expert. Every year Kirk Herbstreit names his top players in several traditional and also some not so traditional categories. It’s always a fun read and Herbstreit really knows his stuff and doesn’t just pick the same 5 most hyped guys as the rest of the media would. I think all four guys are definitely deserving and no glaring Longhorn-related omissions. There’s definitely a few player that I think will earn their way onto this list (namely [tag]Earl Thomas[/tag] and [tag]Aaron Williams[/tag]) but there is still much to prove on the field for those guys. Go check out the full list.